VIEW OUR RINGS CATEGORY FOR OUR CURRENT SELECTION. 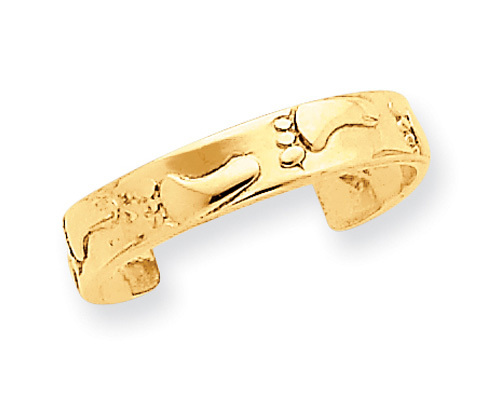 This Footprints toe ring in 14K gold from Apples of Gold Jewelry is a great gift to someone who holds the "Footprints in the Sand" poem dear to their heart. The toe ring, which is made from 14K yellow gold for a warm and sweet look, has a band that measures 3mm in width. Along the band are small footprints, one after the other, around the whole of the band. This special ring can be given to someone as a piece of inspirational jewelry, and makes a wonderful gift for someone you care for. We guarantee our Footprints Toe Ring, 14K Gold to be high quality, authentic jewelry, as described above.